Town clerk Hillary Conklin swears in Tisbury police chief Mark Saloio; selectman Tristan Israel looks on. 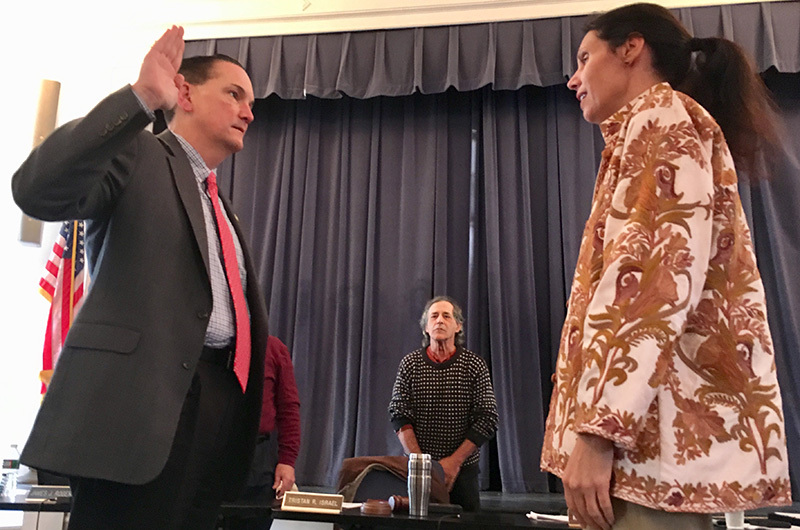 With a large show of support from the town fire, police and EMS, Tisbury’s new police chief Mark Saloio was sworn in Tuesday evening at the Katharine Cornell Theatre. Mr. Saloio will replace retiring police chief Daniel Hanavan in two weeks. He has worked in law enforcement for 25 years, most recently as the administrative lieutenant at the Sturbridge police department. 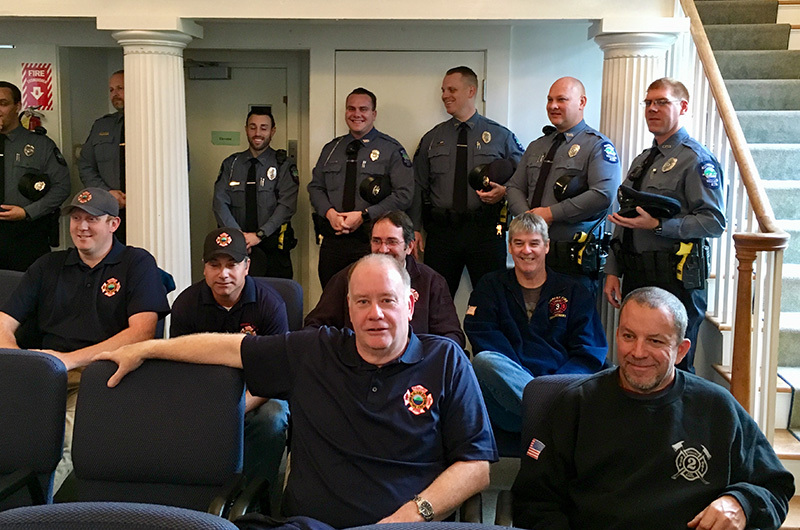 After a hearty round of applause and whistles, selectman and board chairman Tristan Israel thanked the police chief search committee and the members of the department. Chief Saloio’s first day on the job is Nov. 5. After the room cleared, selectmen moved on to other town business, including a discussion with Dan Seidman, a board member of the Dukes County Regional Housing Authority, about town requirements for funding the regional housing authority. The housing authority manages affordable rental housing units on the Island, assists with organizing housing lotteries and distributes rental assistance. Mr. Seidman said the organization receives payments once per year from most Island towns after budgets are approved by voters at town meeting, but Tisbury requires additional specific budget reviews before it reimburses the organization for expenses. Mr. Seidman said the arrangement was agreed on two years ago by the finance committee, selectmen and housing authority director David Vigneault, but he believes the housing authority agreed to it in error. He said the organization is short $5,362 from last year’s budget, which was previously approved by Tisbury voters at town meeting. Town administrator Jay Grande said he thought it would be best if the regional housing authority received the funding up front. “There must be some way to address these concerns and have the reporting in such a manner that we can assess performance at the end of the fiscal year in performance for the new fiscal year,” Mr. Grande said. He said town accountant Suzanne Kennedy, finance director Jon Snyder and finance committee chairman Jeff Kristal had raised concerns. Mr. Grande later confirmed that some concerns were related to employee retirement benefits. Mr. Snyder said he thought the selectmen and finance committee should decide whether to make changes. Mr. Israel said he would feel more comfortable making changes with more information. Selectmen asked Mr. Snyder to give an update about the regional housing authority’s outstanding funds, and said it is time to set out a broader written policy for regional organization budgeting to achieve consistency. Selectmen also approved an application for an all-alcohol license for the Golden Bull Brazilian Steak House after hearing from restaurant owner Thiago Machado and his attorney Geoghan Coogan. Mr. Coogan said restaurant owners expect to open in the next couple of weeks. “We decided to open a Brazilian steakhouse to present to the American community the authentic way to make barbecue the way Brazilians make barbecue,” Mr. Machado said. Beach Road resident Frank Brunelle made an appeal to town residents to look for records of shade trees planted by the Friends of Tisbury. He hopes to find documentation to help him protect any shade trees on Beach Road from being removed. He said he had received confirmation from Ralph Packer that such documents exist for trees on Beach Road. “No one knows where these are,” Mr. Brunelle said. After a discussion with Department of Public Works director Ray Tattersall, selectmen voted put in a new crosswalk with solar-powered flashing lights at the Hillside Village Elderly housing complex. The crosswalk gives residents access to the bus stop across the road from the housing complex. Selectmen also voted to increase the annual fee for the Beach street parking lot from $1,200 to $2,000. The following year the fee will go up again to $2,500.